Come & see some of the most glorious views that Anglesey has to offer, here at Penmon Point. Set on the Eastern Peninsular of this magical island with stunning sea views overlooking Puffin Island, The Great Orme & Mount Snowdon. Throughout the morning and afternoon we offer a selection of hot & cold snacks, ice-creams, speciality coffees & a variety of mouth-watering cakes. We also serve delicious Welsh cream teas. So whether you're a fisherman, a birdwatcher, a walker or would simply like to catch glimpse of a Puffin, seal, dolpin or beautiful sunset, then feel free to come & visit us here at Penmon Point. Families and dogs are welcome plus we also have a small souvenir shop. Wheelchair access is also available. We have indoor & outdoor seating so you can watch the world go by at your leisure. 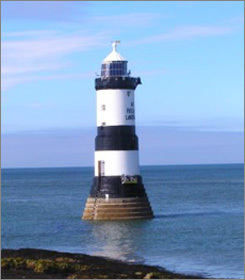 The present lighthouse is 29 metres tall & was designed by James Walker & built in 1835-1838. The lamp was converted to solarpower in 1996.At present the Lighthouse has a 15,000 candela light that can be seen 12 nautical miles away & a 178 kilogram fog bell that sounds once every 30 seconds.